If there is one thing in Canby that is the best kept secret, it’s a 3.5-mile trail that bisects the community, with bridges over roads and highways. Called the “Logging Road Trail” by locals, it really is the remnants of the Molalla Forest Road, which was a route use by log trucks to bring timber to the Willamette River. Today it has become a straight trail that offers some of the smoothest bike rides, runs, skates and walks around the state. The trial is closed off to vehicle traffic, so you can use it without fear of being run over – except for those bicyclists who try to see how much speed they can get on the paved course. Overall it’s a wonderful experiences running along both residential neighborhoods, commercial and industrial properties and ending at the Willamette River. While there is no easy access to the river, there are artifacts of the logging operation, and you can look out over the water and see plenty of wildlife, boaters and the amazing homes across the river. There are several places to access the trail, with the easiest being off of Territorial Road in North Canby. The northern-most access point has a parking lot and features “Eco Park” where there are dirt trails that run through virtually untouched forested areas, so you can look at the plants and wildlife that the area has to offer. 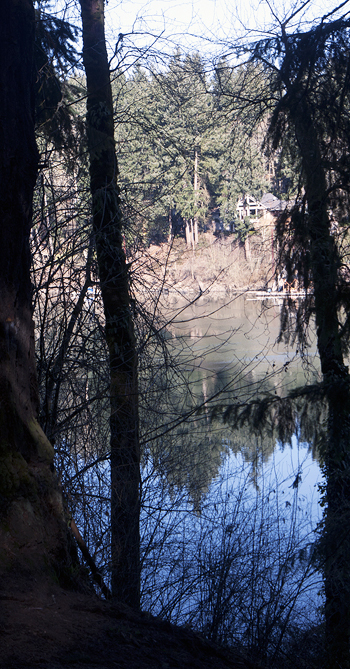 The day I visited we started off at Eco Park and walked toward the Willamette River. Eco Park is about 1.5 miles from the river, and it was a nice flat stroll to the end of the trail. Along the trail there was also a disc-golf course, which was in a forested area making it have an added challenge than the open disc golf courses. The trail also goes along the Willamette Valley Country Club, which is a private golf course in Canby. It opens up around the course and there are some pretty nice views of the course, Mt. Hood and the surrounding area. The trail is fairly flat throughout its entire 3.5 mile length. The only challenging part is when it starts heading up to a large bridge that crosses both train tracks and Highway 99E. This is a significant bridge and the run-up to it can be challenging if you are on a bike or running. There are several other places to access the trail, one being Baker Prairie Middle School and Trost Elementary School on the south side of Canby and also near Fourth Street in Canby. At the south end of the trail there is an access point, but as of this writing there was no parking. Many people from south-side neighborhoods will walk along 13th Avenue and enter the trail that way, but if you are coming from out-of-the-area the Territorial Road access point is the best if you have a car. A beautiful wooden bridge is a part of the trail that helps it over Township Road – another busy Canby street – so there are no interactions with motor vehicles on the trail. However the trail is wide enough to facilitate fire trucks and police cars, so now and then you will see a patrol on the trail to keep an eye on trail-goers. The trail is paved and very well maintained, in addition there are spots where you can leave the trail and there are several porta-potties along the trail too. Over the years there has been talk of extending the trail out toward Molalla, and Molalla Forest Road does continue after the trail ends on the south side of town. Funding issues have slowed that talk as of this writing. About Canby Logging Road Trail: A 3.5 mile paved trail that bisects Canby and offers bikers, skaters, walkers and runners a quiet, long stretch of trail they can exercise on. It starts at 13th Avenue in South Canby and runs to the Willamette River in North Canby. What to bring: This walking trail is fine for comfortable walking shoes, however you will see people in flip-flops and other types of shoes. It just depends on how fast and far you plan on walking on the very easy trail. The trial is also outdoors, so weather-appropriate clothing is also suggested. Tip: My favorite part of the trail is the bridge over Highway 99E and the railroad tracks. If you time it right you can watch a trail go beneath you and see all the cars. I also enjoy riding a bike on the trail, as it’s very smooth and you don’t have to worry about cars. Season: The trail is open year-round. Getting there: There are several access points to the trail, however for those out of town, the easiest place to access the trail is Eco Park at 1314 NE Territorial Road in North Canby.